Props! I never noticed the Props section either, lol! Thanks! These are awesome! I appreciate you. Thank you. Oh, these look awesome! Love creating little scenes on these types of bases and putting a glass dome over them. Thanks so much! You're very generous with the results of your hard work. Thanks are cheap, I know, but for what they're worth, you have mine. Sincerely. This aspect of the resource is very useful, thank you very much! Thank you for the instructions with these scenes. That helps greatly! Thanks for sharing these great scenes. Don't think you can use my stuff for 3D Printing. Will have to find out a bit more about it. These are great. 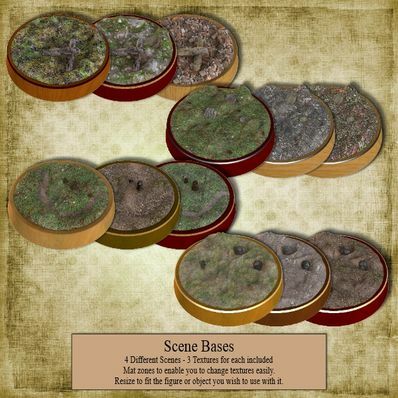 DAZ Inc are going to be offering a 3D printing service soon and these Scene Bases will be ideal for that. I'm goinf to user these for quick renders so I don't have to load large scene.. Thanks very much, Will.. Much appreciated..